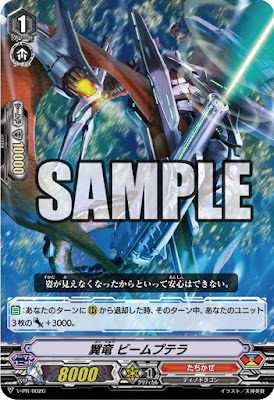 The official Monthly Bushiroad magazine Twitter account tweeted a sample image of the upcoming promo card for the issue out June 8th, the Tachikaze unit Winged Dragon Beamptero. AUTO: When it's retired from Rearguard Circle during your turn, 3 of your units get Power +3000 until end of turn. The card is a remake of the grade 1 unit of the same name from Booster Set 8: Blue Storm Armada, first printed back in 2012. That incarnation of Beamptero could only power up a single unit when it was retired during the battle phase, while this Beamptero can power up three times as many at any point during your turn. Of note is that the unit does not require itself to be retired by card effects, so simply calling over it normally will resolve Beamptero's skill.